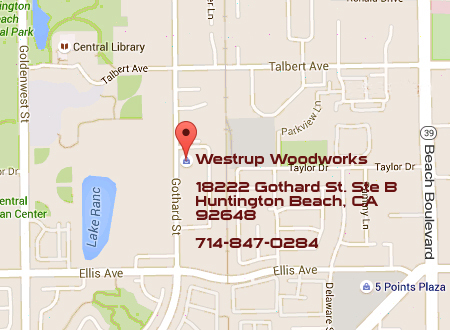 Westrup Woodworks, Inc., is a custom cabinet shop located in Huntington Beach, California. It is owned and operated by the father-son team of Ron and Dean Westrup. Ron and Dean are third and fourth generation woodworkers. Westrup Woodworks had its roots in a backyard workshop where Ron spent years designing and building furniture and cabinets for family and friends as a hobby. In 1991, the business, then known as HB Sanding, officially opened its doors in a small shop in northwest Huntington Beach. 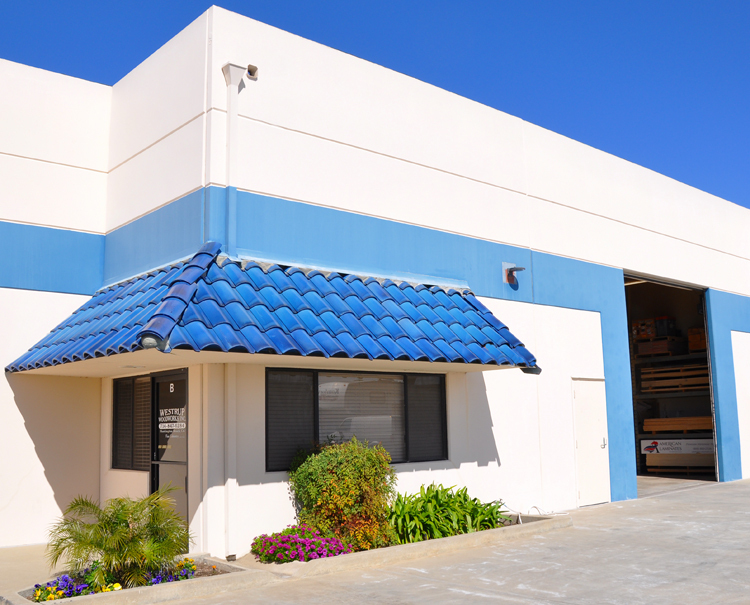 In early 1992, it moved to its present location at 18222 Gothard Street in Huntington Beach. It has been serving the community ever since. In 1999, the company changed its name from HB Sanding to Westrup Woodworks, Inc., to reflect its expanding operations as a manufacturer and installer of premium custom cabinets. In recent years, Westrup Woodworks has continued to expand and grow. Its services now include all areas of cabinetry and remodeling, including designing, construction, installation, finish work, countertops, flooring, plumbing, and electrical contracting. Westrup Woodworks is proud of its quality product, its dependability, and the care that it provides to its customers from start to finish. Ron and Dean are hands-on involved in each project, from preliminary estimates to design to building and installation to finishing touches. Their quality of workmanship and their excellent customer service have led to a company with many satisfied customers and an excellent reputation in the community. Westrup Woodworks looks forward to offering its customers many more years of lasting design and quality construction. Several years ago Westrup did custom cabinets for our kitchen. The craftsmanship was excellent and Dean was very easy to work with. Dean recently did some shelving for a closet and again the quality was great and the price very reasonable. Highly recommend these guys. 1) Built a customized cabinet measuring 22" X 124". Matched the stain of an adjacent cabinet. Terrific match. 2) Refinished the top of an older buffet server measuring 19" X 43". 3) Built 2 customized bathroom cabinets measuring 25" X 48". We are very pleased with results. All the cabinets look beautiful and meet our needs perfectly. Dean Westrup was a pleasure to work with. We are happy we found this company. We were dreaming to build a walk-in closet in our house from real natural wood and Ron and Dean were the only persons who helped our dream to come true. Our walk-in closet looks much better than anything we saw in custom closets showrooms. They did an excellent job, paying attention to every detail. And the price was reasonable. My wife and I recently completed an extensive kitchen remodel with Westrup Woodworks installing our kitchen cabinets. We initially went to Home Depot and they did a wonderful presentation on their computer of what the completed cabinets would look like in our home. We had blueprints in hand and they based their plan/quote on that. After receiving our quote we went to visit a friend who Westrup Woodworks provided service for. We liked what we saw and called and spoke with Dean. Dean was professional and prompt on the day of his visit. He reviewed our plans and discussed endless options for us to consider. We decided on a finished product and were provided a reasonable quote which was less then what Home Depot offered. The margin wasn't significant, but what we received in return far exceeded any value received by two other quotes. Dean worked closely with our electrician and our general contractor to insure the cabinets were installed correctly while working in and around other contractor's time frame. Timing was everything and Westrup did their installation which allowed the project to continue without delay. While reviewing our blueprints Dean noticed inconsistencies after drywall was removed. Dean foresaw issues down the line and adjusted his measurements to insure a proper fit. If we had went with the Home Depot install this issue would not have been addressed and the cabinets would not have fit. This would have been expensive if not a time consuming event if this issue was not caught by Dean. It's amazing an inch or two can have thrown the entire project upside down. In the end Dean delivered and he was good to his word. Imagine that in the world of contracting. We all have our horror stories, but Dean set the bar high for others to follow. I found this place by pure luck. My neighbor was getting new cabinets installed, and I stopped by to check it out. Everything was custom made and beautifully put together, and oh, that smell of the wood. the real wood smell. So we went to Dean's shop and asked if he can make a pull out pantry for us, and sure he was able to help us out. Here comes the important part: pricing. Dean's pricing was fair. Trust me, we got a price quote from home depot, the container stores, even looked it up on amazon and it was pretty comparable. Plus, these would be DIY. I am just not that handy. Dean came to our house to measure the cabinet, made new pantry shelves and installed it for us. It was perfect. man, its so beautiful, I wanna cry ... and did I mention the fresh wood smell now lingers in my kitchen? We heard about Westrup Woodworks from a neighbor and decided to go by their shop on Gothard to get a quote for our kitchen remodel. We met with Ron and his son Dean and got to see their shop. After getting a quote from the Home Depot, we decided to have Westrup Woodworks do our kitchen. We dreaded the construction but were very surprised that our kitchen was more or less usable through the entire process. Ron left the old cabinets in place till the new ones were done and put plywood on top of the counter. I was only out of a sink for a short time and was able to cook with a crock-pot and convectional oven during the remodel. Ron and Dean advised us with the design, recommended excellent electricians and plumbers and coordinated everything. We have had our kitchen for over 12 years and it looks still brand new. We have hired them since for new bathroom cabinets (3), custom framing of matching mirrors and a custom desk with cabinet above. All the drawers slide perfect, the wood is gorgeous, the shelves are adjustable etc. Ron and Dean are masters of their craft and perfectionists. I have recommended them to all of my friends and neighbors and just on my one block street they have done 3 more entire kitchens and a variety of custom woodwork. Give them a try, you will not be disappointed. Their pricing is also reasonable.